The dining room still needs work, but we’re getting closer. It still needs touch up work, and the trim on the windows hasn’t been finished. I do like the way it looks though. I was afraid that the bottom color would look too dark when we got it on. I really like the yellow. I think we’ll use a lighter shade of the same color for the master bedroom. Those are monster windows aren’t they? We measured yesterday, they’re 6 1/2 feet tall. 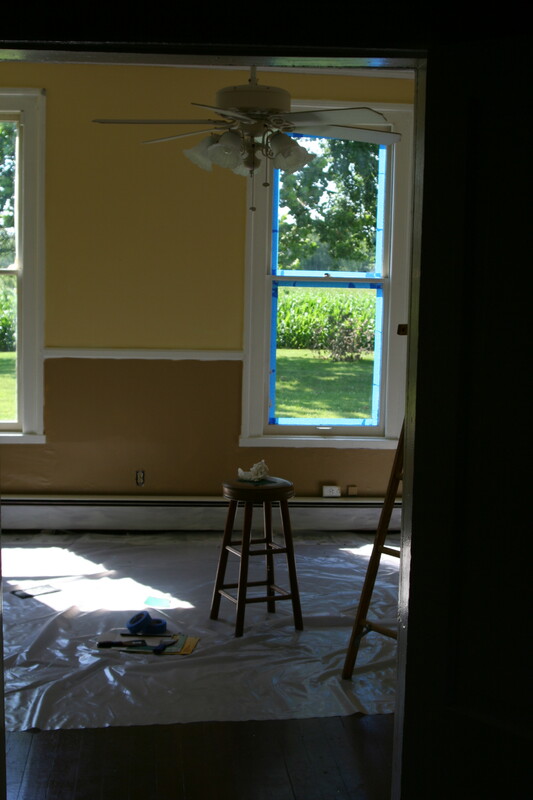 I felt pretty stupid as I spent a long time scraping paint from a prior trim job off the window, then taping it so we could repaint it. Only after I’d finished did it occur to me that we might as well have just painted it without tape and then scraped old and new paint at the end. At least we realized that there was an easier way before I did the second window too. 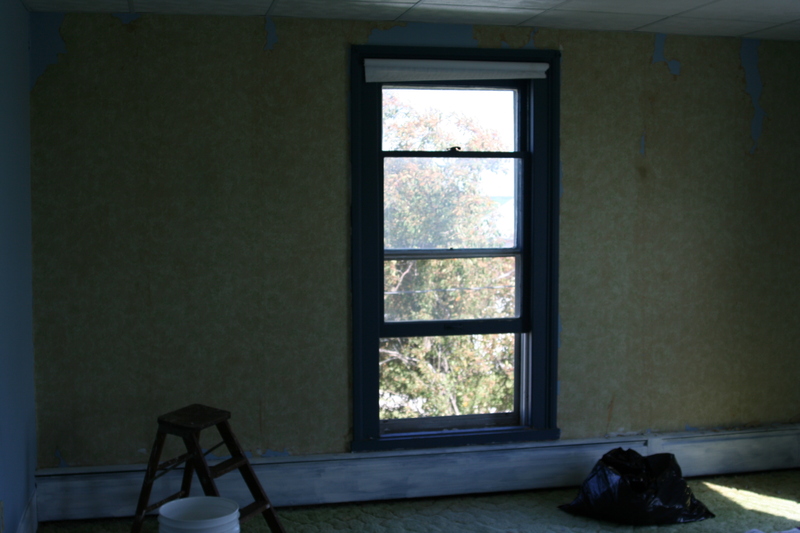 I also started prepping trim and clearing wallpaper in the master bedroom. I was planning to use Wallwik (http://www.wallwik.com/) to remove the wallpaper. In a very brief Internet search, I found some good reviews for it. Apparently it’s even more of a wonder product than I had realized. I ordered it last week, and when it came I shoved the box into the mbr where it sat for several days before I got around to opening the box. On Sunday I finally got everything ready (well, I finally remembered to bring a bucket to mix everything in), and was ready to start using the Wallwik. First I wanted to pull off a little piece of wallpaper that looked loose. Twenty minutes later, almost all the wallpaper was off that wall with absolutely no product used at all. Apparently the mere presence of Wallwik will frighten old paper into falling off the wall. My panel of wallpaper experts dropped by yesterday afternoon and determined that I should now NOT use the Wallwik. They feel the paper underneath the top layer is acceptable enough for painting, while the plaster under that might be questionable. I’m going to test paint a small area, but I trust their judgement way more than I trust mine. I was toying with the idea of pulling down the paper on the other walls in the mbr, but they pointed out that the one other problem spot could be pulled down, and then the rest left alone. I’m kind of itching to do it, but I think if I lay down in a dark room the urge will pass. There are still a few bits of wallpaper to be cleared, but that’s more a matter of needing a better ladder. I was standing on that step stool when I suddenly pictured myself falling right through the window. The ground is a long way down from there. This week’s plan involves moving more stuff, finishing the paint in the dining room, and finishing the prep in the mbr for painting. That sounds a little ambitious now that I think about it. While we’re doing all that, the electrical work is proceeding. This is good as we discovered while painting that if you plug the vacuum in while the ceiling fan is on, they’ll both conk out. The fix involves jumping up and down in the kitchen to jiggle something in the basement back into place. I don’t think that’s probably a good sign.